Clive : Oh man! Why can’t you do that? Jamaican born nurse Clive King is married with two sons. Before nursing he was previously a gym teacher, and he still trained at the local boys’ football team. He was charming with children, and tolerated racist remarks – only occasionally letting his anger show, but he was racked with stress because of his low wage, which caused him to be a heavy smoker and more seriously a serious boozer – even on shift. In the first episode it shows his dangerous drinking habits, when a police sergeant reveals to Ewart that Clive has two previous drink driving charges. In Ep.2, Clive’s smooth talking is shown on a young girl, whose step sister has fallen from a bridge, she won’t talk to anyone but eventually opens up to Clive. In Ep.3, Clive suffers racial abuse from a regular old lady Winnie, he leaves her to stew in a corridor and is told off by Baz. In Ep.4, Kuba tries to teach Clive a lesson for drinking on shift by filling his whisky bottle with cold tea – Clive is not impressed. In Ep.6, the staff are holding a demonstration outside a cinema, Clive passes by with his two sons to wish them luck. In Ep.7, Clive and Charlie interview an architect who they believe has abused his wife and child. He is an old friend of Surgeon Rupert Thalton. In Ep.9, Clive makes fun of Duffy who has failed her driving test. Also an athletic young man comes in complaining of leg pain, saying he injured it playing judo. He won’t let any woman investigate, and tells Duffy to ‘piss off’. When Clive sees him, he reveals to have a boil on his bum. 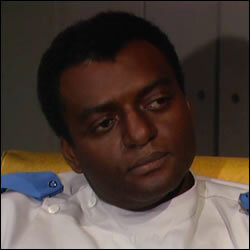 In Ep.10, Clive helps to kidnap Megan from a ward which she is in for her operation, as she is bored. In Ep.13, Clive tells an upset Charlie off for leaving the keys by the drugs cupboard. He also treats a man who has overdosed to get the attention of a lady friend, who he thinks doesn’t love him. Clive reminds him life is precious. In Ep.14, Charlie has just found out Baz has had an abortion, later in the staff room, Clive is discussing with Charlie a case about a virgin male patient, who is worried about his performance on his wedding night. Charlie misunderstands him, thinking he’s referring to him and Baz and attempts to hit him. In Clive’s last episode, staff have heard that the hospital is to be shut down in a month. They meet to discuss way of gaining public support and hold a demonstration outside the hospital. S1 E13 – Clive treats a patient who has overdosed because of unrequited love.